Tortoise beetles are adorable little creatures that sometimes can cause considerable defoliation during severe infestation. The young larvae scrape on the surface of the leaves leaving a pale or brown translucent membrane. Older larvae and adults produce round holes. Tortoise beetles are seldom a serious pest. Adult beetles are round, turtle-like insects. They have thin margins that extend out from their body as well as a shield-like structure that covers their head. Some larvae are interesting because they glue caste skins, debris, and excrement together and hold it over their back like an umbrella. They stick this material at potential predators to protect themselves. Today's species, Cyrtonota abrili, was found in Colombia and named after its collector, G. Abril. 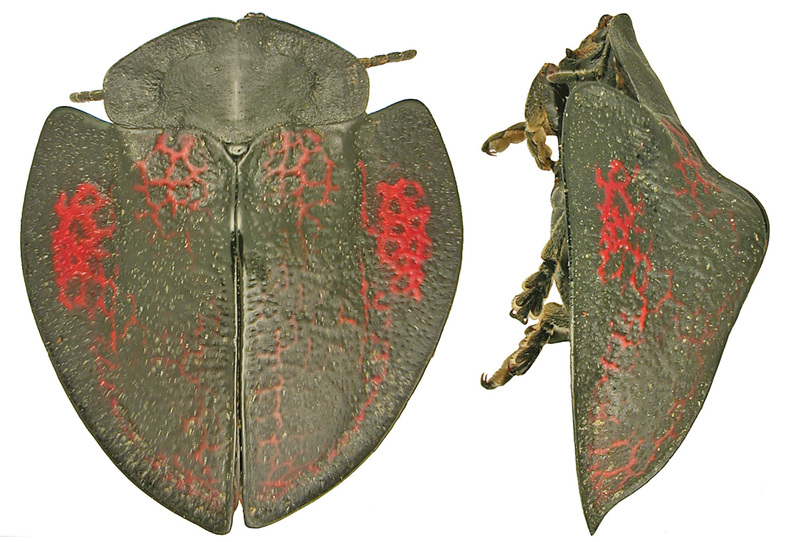 For the experts: A new tortoise beetle species, Cyrtonota abrili, is described from the Antioquia and Caldas departments in Colombia. New faunistic data are provided for 87 species, including 16 new additions to the country’s fauna. A checklist of the known 238 species of tortoise beetles recorded from Colombia is given. Three new tachinid flies: Ametadoria spp.